Layer Code is the third masterwork created by the world renowned choreographer SANG Ji-jia for BeijingDance/LDTX. SANG’s two previous works: Unspeakable and Standing Before Darkness established SANG as an important choreographer of the era, and Layer Code, while premiered in January, 2013 at a black box theatre, the LDTX Theatre,left a strong impression to the audience with its exquisite conception, imaginative setting and overwhelming theatrical tension. Layer Code is now restaged in an authentic procenium theatre, the PLA Theatre, with the collaboration of Beijing’s lighting designer LI Xin and costume designer WANG Yan. The work also features the live-interacting performance by Hong Kong’s musician Dickson DEE and video artist Adrian LEUNG. After its re-run in Beijing, Layer Code will be brought to Guangzhou as the main attraction for the Guangdong Dance Festival. The virtual reality prevails nowadays, where people can override the past record and reset the process by one simple push of a button. What if the life is real? Could the accumulation of living experience be started all over again? The motion and emotion, while repeated, could be the same as those before the reboot? In “Layer Code”, the choreographer imaginatively manipulates the stage’s time and space to allow the dancers and the audience to experience the movements in many layers of setting. It is an experiment itself to explore physically the relationship between the body and the dimensional elements, and to examine philosophically the possibility of human living through a same life again. SANG Ji-Jia An ethnic Tibetan born in Gansu Province, he was named “Star across the Century” by the Guangdong Province in 1997. He was awarded the Asian Cultural Council Scholarship and the American Dance Festival Scholarship in 1998. In 2002, under the auspices of the Rolex Mentor and Protégé Arts Initiative Program, Sang studied choreography under William Forsythe and stayed with the Forsythe Company as choreographer and dancer until 2006. 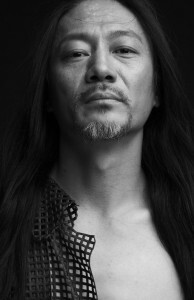 Sang Ji-jia returned to China in 2007 and became the Resident Artist of BeijingDance/LDTX. Sang’s works have a characteristic performative mix of visual art, architecture and multimedia which he adapts into an eastern aesthetic. He have been presented around the world,His major works include 1979, As if to nothing, Not here/Not ever, Layer Code, Comrades, Unspeakable, Sticks, Standing Before Darkness, etc. Dickson Dee(Li Chin Sung) is the most active Hong Kong man in the experimental music world, and works as a producer, composer, sound artist, label founder, organizer and planner to perform with different creation codes and multiple bands. His music style is very diverse and blends industrial noise, experimental electronic, Avant Garde, contemporary neoclassical collage, etc. He also has published more than 20 CD and DVD. Adrian Yeung Chun Yip is a video designer for theatre and dance performances. He graduated from the University of Hong Kong in computer engineering and worked as a professional computer programmer for 9 years. Later he turned to the field of theatre. Since 2007 he has participated in more than 30 theatre or dance productions and become one of the most active video designers in Hong Kong. His video work in CCDC’s “As If To Nothing” was nominated for the HK dance awards 2010. LI Xin is a Lighting designer, graduated from the National Academy of Chinese Theatre Arts. He is a lighting designer and also worked with video design for Youth day of Chang’an Grand Theatre, Mid-Autumn Festival, Double Ninth Festival and Chinese Opera. Currently he is also is the Art Director of the Peking University High School’s Theatre and Dance Festival. Xin’s lighting design works cover a wide range of art forms including traditional opera, musicals, children’s drama, electronic music festivals and concerts. Wang Yan is a costume designer, graduating from the Central Academy of Drama with a bachelor’s degree and a master’s degree of Stage Costume Design in 2008. Now she is a teacher of Stage Art Department of Vocational College of Beijing Opera. She has won the ” Costume Design Award of Wenhua ” in the Ninth China Art Festival. She has participated in many design works, including dance drama, acrobatics, musical, evening party and theater.